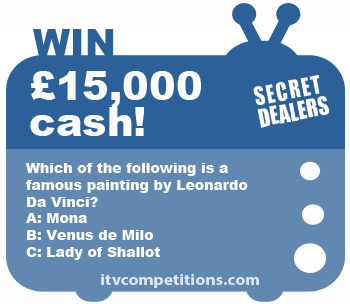 Which of the following is a famous painting by Leonardo Da Vinci? Post – send your entry on a postcard or on or within an envelope to the address as specified in the Programme (postal reference Week 1: SDR 0551, Week 2: SDR 0552, Week 3: SDR 0554, Week 4: SDR 0555 or Week 5: SDR 0556 followed by P.O. Box 7558, Derby DE1 0NQ). Entries received on anything other than a postcard or envelope will not be accepted. In the case of multiple entries received in an envelope or postcard, only one entry will be entered into the Prize Draw. Sufficient postage must be paid – any entries without sufficient postage will be discounted. The Promoter and producers bear no responsibility for any entry that is incorrectly submitted, lost or received after the closing date, or damaged in any way. Sms & Phone cost +£1.50 and as such are not recommended due to the high costs.